The uprisings that swept across the Arab World in 2011 were remarkable in many ways. They constituted a serious challenge to the authority of the most coherent bloc of authoritarian regimes. During spring that year, the streets across Arab capitals were filled with people expressing their grievances and demanding change. The protests broke with the oriental and paternalistic perception of 'respected' authoritarian leaders. The Arab uprisings also taught us that demography matters. It was the disenfranchised youth that initiated the protests in most places, a faction of society that never before appeared on the stage as a relevant political actor. Young Arabs assembled and screamed the same slogans towards the parliaments and palaces from Sanaa to Rabat. Despite all that, four years on - except for Tunisia - we are left with consolidated dictatorship, outright civil war or failed states, recently illustrated by the coup of the Houthi militia in Yemen and the violent fourth anniversary of the revolution in Egypt. Although the phenomena of state disintegration and the reinstatement of strongmen such as Al-Sisi in Cairo seem to be at opposite ends of a spectrum, they are closely related. The revival of authoritarianism after popular uprisings against these regimes can partly be explained by the failure to consolidate stability, in Libya, Egypt and Yemen. Consequently, fellow despots the region legitimised their crack down of protests with increasing instability in the neighbourhood and the deteriorating regional security situation. Thus beyond specific domestic drivers the restoration of authoritarian rule can be seen as a response to increasing uncertainty about the outcomes of the Arab revolutions. Popular support for mass protests throughout the region dramatically declined over the course of 2011. In some instances, this was due to the coercive response by the regimes (as in Syria or Bahrain). In others, the decline can partly be explained by fear of instability (Morocco, Jordan and Algeria). An activist from the protest movement in Morocco summed up: 'the aftermath of the popular uprisings in Syria, Libya and Egypt scared the people from the street. They preferred stability over the possibility of chaos'. Many regimes credibly established the importance of security and stability as an effective counter narrative to the expression of grievances under authoritarian rule. 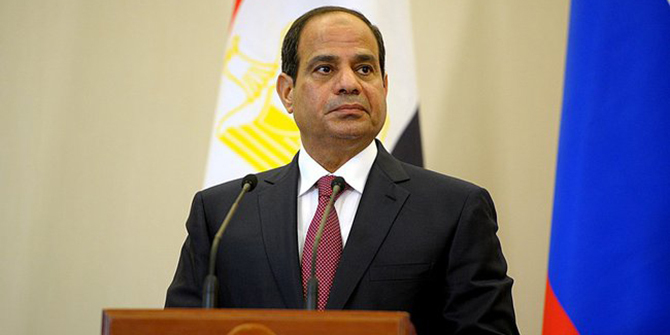 The former general and new Egyptian president Al-Sisi drew on the longing for security and stability in parts of the population setting out his candidacy for the presidential office saying: 'We are threatened by the terrorist [...] who seek the destruction of our life, safety and security'. This emphasis on law-and-order in the face of spreading instability and crumbling statehood went hand in hand with denying any legitimate alternative to the politics of an iron fist. In fact, demonising political opponents as anarchists or fundamentalists is part of the winning strategy. Such rhetoric can increasingly be found in speeches of autocrats across the region from Bashar Al Assad to Mohammed VI of Morocco: 'There are no degrees of patriotism or of treason. For either one is a patriot, or one is a traitor. 'The construction of a threat in the face of a popular uprising is not a new strategy and has proven effective for those states that were able to avoid a regime breakdown. It has a similarity with what the Carl Schmitt once described as the friend-enemy distinction. However, even in Tunisia - the lighthouse of the Arab Uprisings - threat scenarios are constantly used by parts of the old elite to prevent substantial reform of the interior ministry and the related security forces. Amine Khali a Tunisian researcher working on transitional justice said: 'The window for security sector reform is closing. The interior ministry successfully pacted with old and new elites in the face of growing security concerns in order to avoid substantial reform and accountability'. What is so worrying about this development? The answer boils down to the fact that the authoritarian elements have prevented change by successfully creating a threat and imposing themselves as the only alternative. They have instrumentalised fear in their favour and ultimately securitised the regimes themselves. After this rather pessimistic account one question remains: What lessons can we draw from this? As mentioned in the beginning of the article, an entire generation, which constitutes the majority of the population in the Arab World, has risen up against oppression. Although they might become disillusioned and fall back into political apathy, their grievances will not fade as long as despotism reigns in the region. For as long as the underlying reasons are not addressed the new stability of the iron fist might only be short-lived. The next time the young generation makes their voices heard the West should be prepared to stand by their side. To help them overcome the fear of chaos and anarchy.Pressing for an inclusive and open transition process in which less institutionalised civil society groups have a real say in the political negotiations that determine the rules of the game can ensure the participation of oftentimes-sidelined groups. Empowering less institutionalised groups through capacity building and resources provides another option.Most importantly, the acceptance of the rules that apply for a smooth political transition process has to be ensured. Compliance with such rules should be monitored and insisted upon by foreign governments as well as activists and politicians in transitioning countries alike. Installing credible independent arbitration mechanisms domestically and regional or even international ones to intermediate in times of crisis between actors in negotiations might help to avoid one-sided escalations of politicised debates in crucial areas.A rush to fast elections not only marginalises less institutionalised groups (such as the youth) but also introduces competition for political power and thus makes consensual decision-making amongst actors less likely. The balance between inclusion, consensus and universal suffrage at the ballot box is crucial for transition processes and has to align legal as well as democratic standards to avoid alienation amongst actors during a first transition phase.All the three aforementioned points: inclusive and consensual decision-making, limited politicisation and competition and the respect of the rules and the transition roadmap are crucial in order to avoid sliding from uncertainty into violence, conflict or even disintegration.